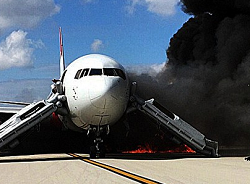 During taxi, an engine caught fire prompting the crew to perform an emergency evacuation in which 15 people were injured.. 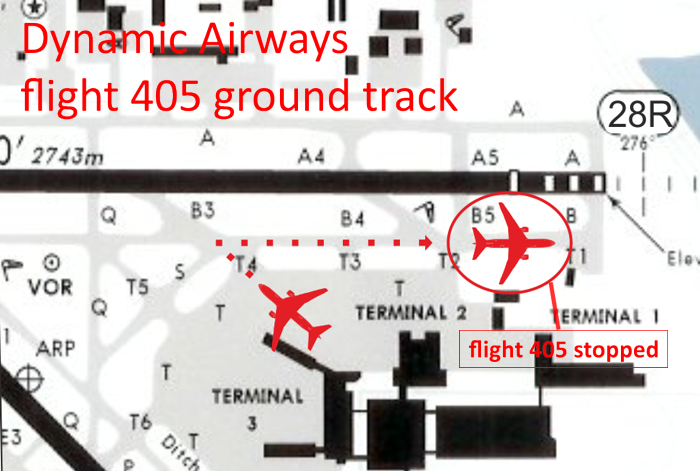 Dynamic Airways charter flight D2 405 was taxiing out from the temrinal to the departure runway 28R, via taxiway „Bravo“ when its left engine (JT9D) leaked large amounts of jet fuel. 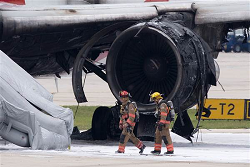 The pilots stopped in the holding area before line-up and requested to taxi back to the terminal, when the spilled fuel from engine #1 suddenly caught fire. Realizing massive smoke and flames coming from the left side of the aircraft, an emergency evacuation via onboard slides was initiated. Exits were L1 R1 and R2. Evacuation was completed within 6 minutes. It is understood that 15 people were taken to local hospitals, one of them received serious injuries. Another 12 were treated as outpatient received minor bruises in the evacuation. 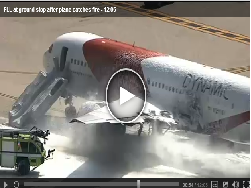 Airport fire services foamed the engine but the fire continued to burn and was finally extinguished after seven minutes. 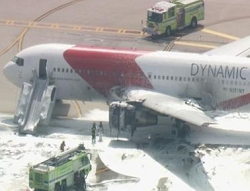 There are no reports of injuries, the 767 received substantial damage. 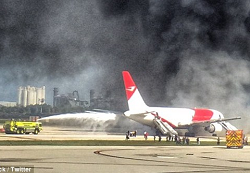 Operations at Ft.Lauderdale Airport were disrupted bacause the main taxiway was contaminated by jet fuel over a large area (about 600 meters) . 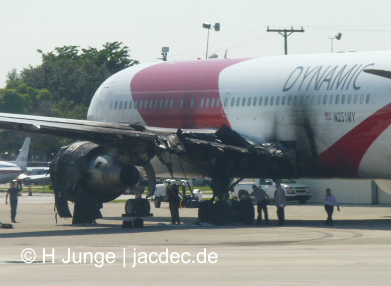 Damage to the 767 is substantial. On 2015-11-03 the NTSB released a press statement about the preliminary investigation result. Of the 90 passengers and 11 crewmembers onboard the airplane, one was seriously injured and 21 sustained minor injuries as a result of the emergency evacuation. 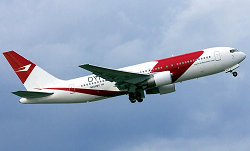 Sunny Airways, Maxjet AW, Kam Air, Phoenix Aviation, Air Gabon, LAX airlines, Polynesian AL, Qatar AW, EgyptAir, Kuwait Airways (delivered in JAN 1986).